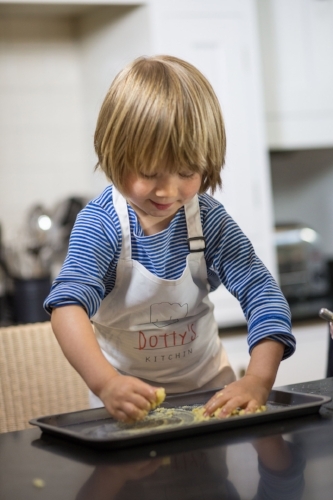 I set up Dotty’s Kitchin after struggling with my own children’s fussy eating habits and finding a lack of advice that really worked. I read numerous books and articles and tried every trick going but none stopped the dread of mealtimes and the heartbreak of scrapping another plate of vegetables in the bin! Eventually I found that involving the children in the cooking process and teaching them about the nutritious quality of food, had a positive effect on their enthusiasm for trying new foods, and on our relationship and family life. Now, my goal is to help parents encourage their kids to be excited about cooking and eating ‘real’ food by assisting restaurants in creating exciting children’s menus and by training children to become little chefs. As well as promoting healthy kids food Catherine also practices as a personal trainer and nutritional advisor. She is a passionate cook and mother of two spirited young children and one nutty golden retriever! Why should you cook with your kids? It's messy, time-consuming, exhausting and often the end result looks more like something you’d feed the dog! Trust me, I know what I’m talking about! I’ve been cooking with my daughter since she was 3 years old; she’s now 7 and has a 3 year old brother who wants in on the action! I started cooking with my daughter because she wouldn’t eat. I say she wouldn’t eat but the truth is she’d happily munch on ‘junk’ food, I just couldn’t get her to enjoy ‘real’ food. It got so bad and I felt so helpless that I was ready to call a psychologist, however, before I did, I decided to make one last attempt to get her interested in food by cooking together. We started simply by making omelettes and buttering toast. Quickly I noticed that her relationship with food was changing and also our relationship. This issue that had, had such a negative effect on our family was now turning into something positive and exciting. Whilst cooking together I noticed that she was not only becoming interested in food but that she was also developing other skills. She loved learning where food came from and what it was good for and couldn’t wait to share those facts with her friends! My proudest moment arose when she came home from school upset because her friends didn’t believe that she was a chef! At that moment I knew I no longer needed to worry about her taking her fussy eating into adulthood and I needed to use my experience to help other parents.